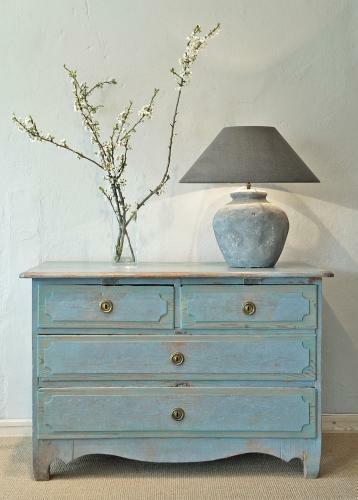 This beautiful chest retains its original charming blue colour and the original gustavian hardware. Very useful and chic. Combine this with one of our Han-Vase lamps and you have a wonderful "Flemish Style" vignette. Locks are missing and have not been replaced, adding to the rustic charm of the item. Example of the "Transition style", that is, Louis XV inspired feet, whilst the rest is allready neoclassic, Louis XVI/Gustavian.